It is quite warm considering our altitude when we get up (14ºC) and we leave at 8:50 am. Our plan is to head to the west coast of Tasmania from here. It is not a long way but I have no idea what the roads and tracks are like, even after reading a few four wheel drive books. We head back onto the main road and head west to the Murchison Highway. As you go you cross the First of May Plains, presumably so named because whoever found them did so on 1 May. These are flat and high, 800 metres or so, and appear to be like a boggy marsh. At the highway we turn right towards Wynyard. At a locality known as Fingerpost, there is a four way intersection (not quite + shaped) and we take the road to Waratah. This leads towards Savage River and Corinna. Just before this there is a very nice rest area that we will stop at in a few days time as we head south from Wynyard. This is called Fossey River Picnic Area. Waratah turns out to be a very small town and it appears that nothing is open. The pub looks okay and there is a reconstruction of a hut that is called Philosopher Smiths Hut (he apparently first found the metal that is mined here). It has a nice picnic area and a small caravan park but nothing else to offer as far as we could see. It is very poorly signposted as I later find out that there is a waterfall in the middle of the town but we never saw the lookout near the pub. 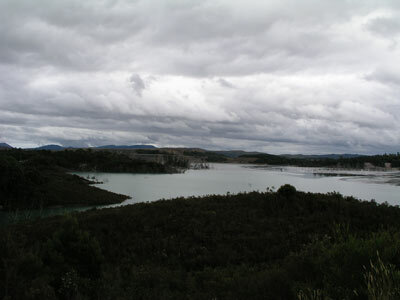 On our second trip to Tasmania, I was amazed to find that there is an iron ore mine there. I only discovered this when I saw a very large wharf that has an ore loading facility between Stanley and Rocky Cape on the north-western coast. It turns out that the ore is pumped in a slurry along a pipe from Savage River to the coast before being dried and loaded on board ships. The road to Savage River is tar but very windy. Even so, so we make good time on this section of the trip. Just out of Waratah we cross a tiny stream that is the Arthur River. We will encounter this again late in the day. We stop near Savage River for a while and look at the mine from a spot that gives a bit of a view. Again, it is disappointing that there is not a proper display that shows details of the mining operation. There are virtually no facilities at Savage River, so do not depend on being able to get anything there. We continue on, now heading south-west towards Corinna. The road is dirt and the going is a bit slower. The terrain changes from plains and forests to rainforest. The road to the township of Arthur River (on the Arthur River of course) and the west coast heads off just before Corinna but as it is only three kilometres, we head in to have a look. Corinna is a tiny little village and we get there at 11:00 am. There is not much here, a few accommodation options, a general store and perhaps fuel (I cannot remember). 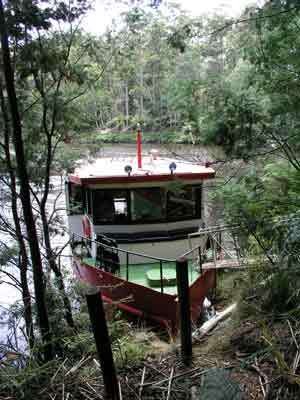 There is also a cruise on the Pieman River that operates from here and we have heard very good reports about it. However, we are not doing it as we have one planned for tomorrow. 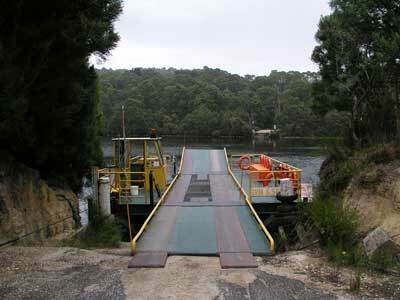 There is also a tiny two car ferry that crosses the Pieman River here. It costs $20 each way. It has an interesting sign, see the attached photos above. We have morning tea in the shelter shed next to the ferry (it is raining again). There are also some nice toilets opposite the general store. There are also camp sites either side of the river. We continue on at 11:40 am after a short break. Again, a very nice little spot. After morning tea we head north out of town and take the road to Arthur River. This is a rougher road and it will take us a while to travel the over 100 kilometres to there. We stop at an alleged scenic lookout that is neither a lookout or scenic. This is supposed to overlook a water race (a man-made water diversion) but we could see nothing. While here a dozen bees got into the car and Kelly panicked a bit, she is allergic to them. It took a bit of effort to get rid of them from the car. A bit further on there is another scenic lookout but again, there is not much to see. However, at the bottom of the steep descent just past here there are very good views to the west. Here we saw the first car since we left Waratah. We stop at Donaldson River at 12:25 pm and find a very nice spot. There is a good camping site on the northern side for a couple of small vans or Shippshapes. The bridge over the river is quite interesting, built of two lots of four logs over which the decking has been placed. The river is great, with a pool west of the bridge. We have lunch here and leave at 12:55 pm. 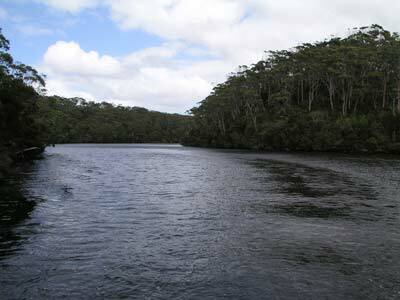 As we cross the Lindsay River we see that there is a good camping site on the north-west side. This is also a nice river. The road improves after the river and at the Balfour intersection, it gets better again. The terrain here is large plains with some isolated forest bits. We arrive at Nelson Bay at 2:27 pm. It has taken just over three hours (including lunch) to travel the 102 kilometres. 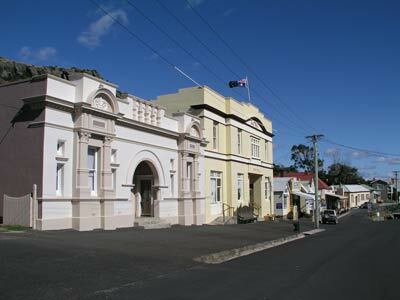 Nelson Bay is a small village just off the main road and on the waterfront. There are some huge crayfish boats here, both anchored and ashore. One is the largest boat I have ever seen in Australia on a trailer. This area has a few cabins and larger houses and there are also a lot of what appear to be permanent caravans behind the sand dune adjacent to the beach. As it turns out, they are not permanent, but for some reason, the Tasmanian Parks and Wildlife Service lets people set up camp for six months over Summer for the paltry fee of $300. The camp sites are supposed to be limited to 10 by 8 metres but they all appear to be much larger in size. As well as the caravans, there are toilet/shower structures, fences and outdoor wood burning heaters. This is repeated in other places on the north-west, in national parks and council camping areas. All these caravans have taken the best spots and there is no-one even using them. A disgrace I reckon. We go to the Sundown Point Camping Area which is right on a creek. This looks like a good place to stay and it does not have permanent caravans. We go back out to the main road and head north to Arthur River. 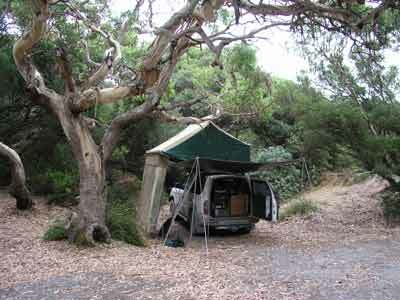 We have a look at the Prickly Wattle Camping Area which is six kilometres south of the township. It is not too bad, but we want to be closer to town. 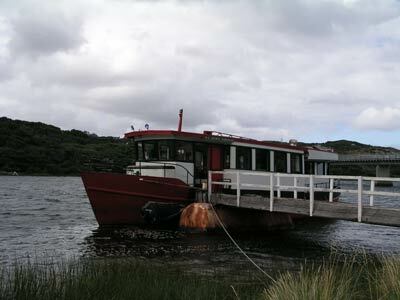 We arrive at Arthur River at 3:45 pm and have a look at the MV George Robinson, the boat we want to go on tomorrow. The sign says to buy the tickets at the general store. We cross back over the river to what I thought was the store but find it only sells tickets to the opposition boat. I guess that there must be another store so we cross the river again and find it a bit further up the road. We purchase two tickets for $74 each. More about this tomorrow. There are two more camping areas just to the north of the town. 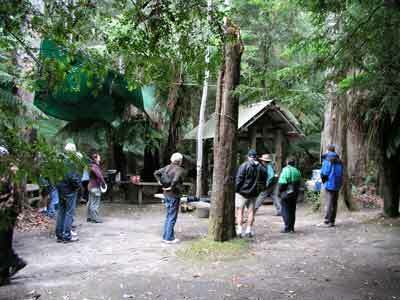 We head to the Manuka Camping Area which is just up the road from the general store. This is quite nice but all the best spots are taken up by the permanent vans or other campervans (mostly permanent vans). This spot had toilets, fire pits and was very large. However, we do not want to stay in the only spots left as there is very little flat areas to park on. We head back to the general store as the other camping area, Peppermint Camping Area is opposite it. This has more vans parked there, although not set up, and it at first appears there are no spots. However, as we are looking, a couple tell us that there are a couple of spots behind a series of bushes. There are a couple of places where we will fit so we pick the best one and set up camp. The cost is $5 per person per night. We are staying two nights so we walk over to the National Parks building and pay our money into the box. The camping area has flushing toilets and cold showers. We go for a walk down to the river but it starts drizzling again. We find another camp site behind us. This is accessed via a road opposite the general store and also leads to a private residence. This has been one of the longest driving days while in Tasmania (and certainly the hardest) so we have a very relaxing dinner of roast beef and vegies. Afterwards, I cook some scones for dessert. The drizzle continues till about midnight and then stops. Today we are not going anywhere (at least in the car). We are going on a river cruise up the Arthur River. As I mentioned earlier, there are a couple of operators here, we have chosen to go on the MV George Robinson which is an older steel hulled timber topped boat (the red boat). This is less elegant than the other newer boat, but as lovers of the sea and boats and ships in general, this older boat is of more interest to Kelly and I. In addition, some friends went on this boat a few years back and told us it was a more relaxed operation. It is windy and cold as we get up at 8:30 am. After breakfast, we walk to the wharf and at 10 am, the boat sets off. There are about 20 people on boat and Robert is driving the boat and Toni is cook and crew. 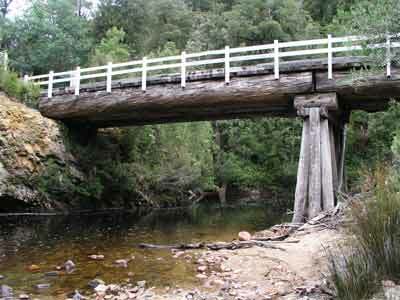 It cruises 14 kilometres up the Arthur River to Turks Landing, the junction with the Frankland River. This takes about 90 minutes. Anyway, as we go along the river, Robert and Toni take turns talking about the history and environment of the river. Soon after the start, there are a pair of sea eagles on the river's edge. The female is the larger of the two and is at least 48 years old. She has been living in this same spot for 41 years. Her previous partner died about 15 years ago when he drowned at the river entrance when he hit a wave. She has a toy boy who is about 21 years old. They have a baby who is now as big as the male and will soon have to leave. When you get to the spot, the boat nudges up to the riverbank and Toni throws a couple of fish onto the bank. 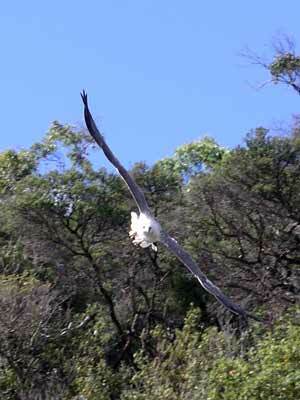 The sea eagles swoop down and grab them. They fly back up into the trees and eat their spoils. There is a dramatic change of vegetation from coastal heath to rainforest as you move up the river. At Turks Landing, you get off the boat and go for a walk in the magnificent forest with Robert while Toni cooks lunch. There are brown stringy eucalypts, blackwood and myrtle trees. On the way up we had noticed that in some sots there were lots of dead eucalypts. Robert explains that they die because the myrtle trees get big and out grow the need for the protection of the eucalypts and they put out a poison that eventually kills the eucalypts. When you get back to the area near the boat, there is a barbecue lunch waiting. The cruise company has built a lunch area with tables, chairs, protection and more. The lunch is very good and includes wine and cordial. After a two hour stop here, the boat heads back to Arthur River. It is very relaxing as the boat slowly motors back down the river. We look again at the magnificient forest and the majestic river. We arrive back at Arthur River at 3:00 pm. It is now blowing even stronger than it was when we left in the morning. We go for a walk out to the river entrance but we went down the wrong street and had to climb over some sand dunes to get to this spot. The spot is called The Edge of the World. There is a viewing platform and toilets here. The river is too shallow for anything but the smallest boat to get out, and even then it would have to be on a day when there are no waves. Today it is blowing at least 30 knots and there are some decent waves breaking. We walk back to the camp site and buy some ice creams on the way. We read till dinner and then I cook another barbecue dinner. During the night it rained a little and it is still windy and cool (12ºC) at 8:30 am. 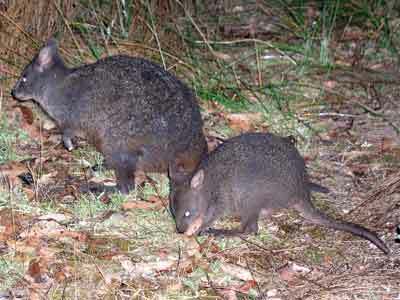 As we are having breakfast, a wombat ambles through the camping area. 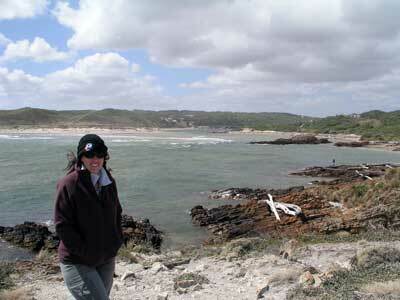 Today we were planning to head to the windiest spot in Australia, Cape Grim. However, the only way you can go there is on an organised tour to Woolnorth Station as it is all private property, even the road. For days I have been trying to find out if there is a tour. Finally, last night I managed to get onto them only to find out that there is no tour (we wanted to do the wind farm tour and they only do these if there is a full tour of Woolnorth). After breakfast, we leave Arthur River at 8:30 am and head north to Marrawah. 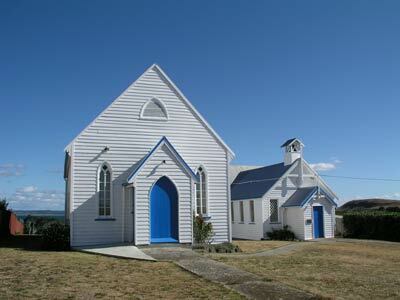 We went out to Green Point which is west of the town. There are a number of people camped here, including a Mercedes sedan and camper trailer that we will see a number of times later in the trip. There is also a picnic area and toilets. It must be a good surfing site as there are a few surfers here. We can also see a lot of the wind turbines at Woolnorth from here. We go back into town and we head north again and take a small track off to the left that is not on our map. It is called Mount Cameron Road and leads to an Aboriginal owned land. You can pass through and go to the beach. There are good views of the ocean. After going back to the main road, we head across from here to a road that cuts across to Montagu. North of the town there is a nice camping area at Sony Point. 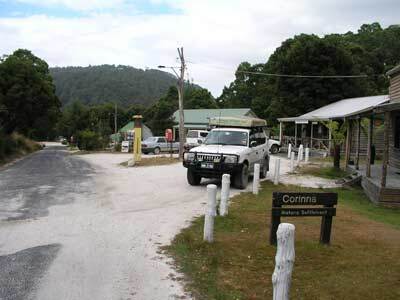 This is council run and, like the national park camping areas at Arthur River, there are numerous permanent caravans taking all the best spots. 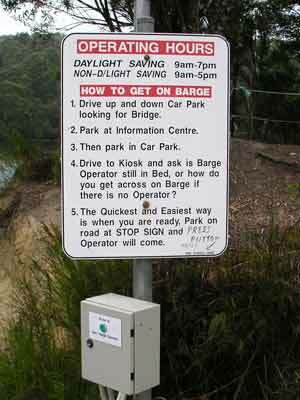 We arrive here at 11:00 am and go to the boat ramp where we have morning tea. There are views across the waterway between the mainland and Robbins Island. The water looks so clean and tropical! 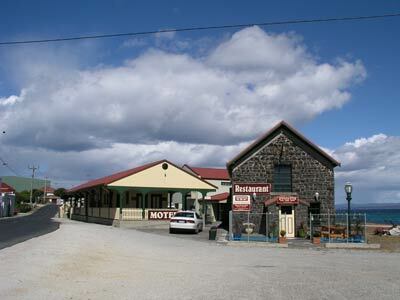 We head east to Smithton and Kelly purchases a couple of dozen oysters at $9.90 a dozen. I have to go to the local hardware store to purchase a new AA battery charger as I spilt beer on ours and it has shorted out. We are only here 15 minutes and we are back on the road at noon. We take the road to Stanley. I love the town of Stanley. When I was at school I studied geography for the Higher School Certificate and one of the places we studied was The Nut and Circular Head. This was because The Nut is a remanent plug from a volcano and it is an almost perfect cylinder that rises up almost 150 metres from the sea and the surrounding land. 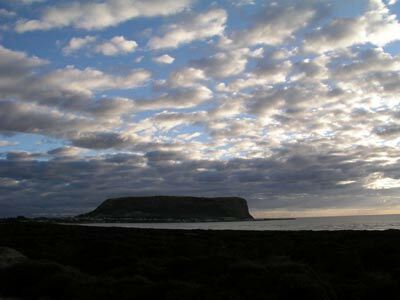 In real life, it provides a dramatic backdrop to the town of Stanley. 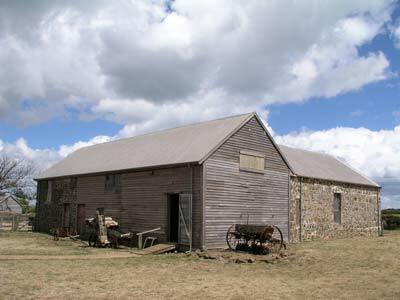 The town is a very historic place, with lots of old timber buildings. There is also a great and large timber wharf. 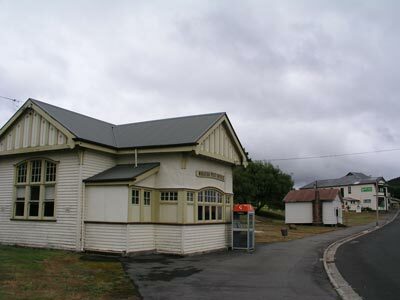 We go first to look at the old signal station that is now a restaurant and accommodation. We then go to Highfields. This was the headquarters for the Van Diemans Land Company. 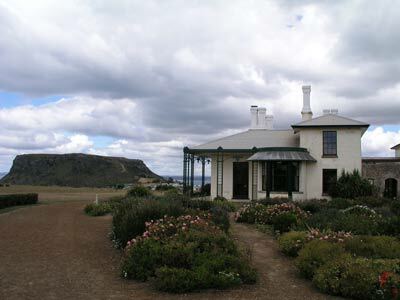 They owned virtually all the north east of Tasmania back in the mid-1800s, including the area now called Woolnorth. 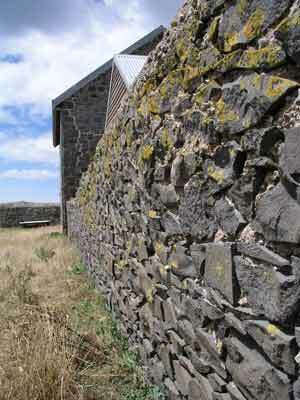 This is a magnificent old house and now maintained by the Parks and Wildlife Service. Entry is $9 and we spend a bit over an hour looking at the house and its outbuildings. We drive the short distance towards the centre of Stanley and we decide to have lunch at Godfreys Beach. We make some lunch and I decide to go for a body surf as the waves are breaking perfectly in the off-shore breeze. I spend about 20 minutes catching waves. It is not too cold in the water, about 19ºC. We leave at 2:40 pm and a minute later we booking into the Stanley Cabin and Tourist Park. I had phoned yesterday and booked a site as some people we met on the boat yesterday said that the park was very full and it is a long weekend in Hobart so we think there might be a lot here. As it turns out, there are plenty of unpowered sites but very few, if any, powered sites left. It costs $22 for the night. After setting up camp we do our washing. The caravan park has its own laundromat so this is convenient. It costs a reasonable $2 each. We hang the washing on the line and then go for a walk. We go for a walk around town. 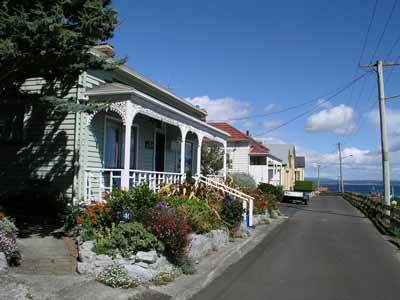 It is a very historic place, with nearly every house in the main centre of the town being from the 1800s. We have a beer at the pub and book dinner in its restaurant for 7:00 pm. By the time we get back to the car, our washing is mostly dry so I throw it in a dryer for 20 minutes. We shower and at 6:00 pm we walk to the pub for a couple of beers before dinner. We have fried battered Camembert cheese as an entree (shared) and Kelly has ocean trout and I have gourmet lamb sausages. Dessert is sticky date pudding and warm apple and blueberry crumble that we share. We wash this down with a nice Tamar Ridge chardonnay. It is a good meal and the restaurant is full, I am glad that we booked. We walk back to the caravan park and are in bed by 9:30 pm.